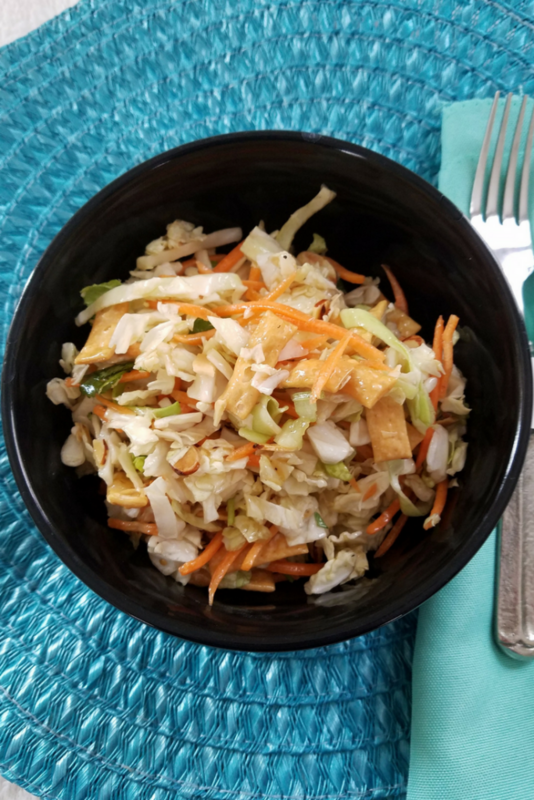 This easy Asian Salad Recipe is definitely one of my new favorite meals. I can have this by itself, or with some chicken or shrimp for a low point meal that is delicious and simple to make. The addition of cabbage makes it a bit more satisfying than a regular salad would be. I mix the dressing and salad together, but you can easily serve up the dressing on the side. With the lower point options, it is easier than ever to make this a full meal. A bit of grilled or shredded chicken really adds bulk to the salad and makes it a meal that is ideal for lunches or dinner. Plus, the flavors are great and make it a hit with the entire family! In a small bowl, whisk together olive oil, sesame oil, rice vinegar, brown sugar, ginger, and garlic until well blended. Set aside. 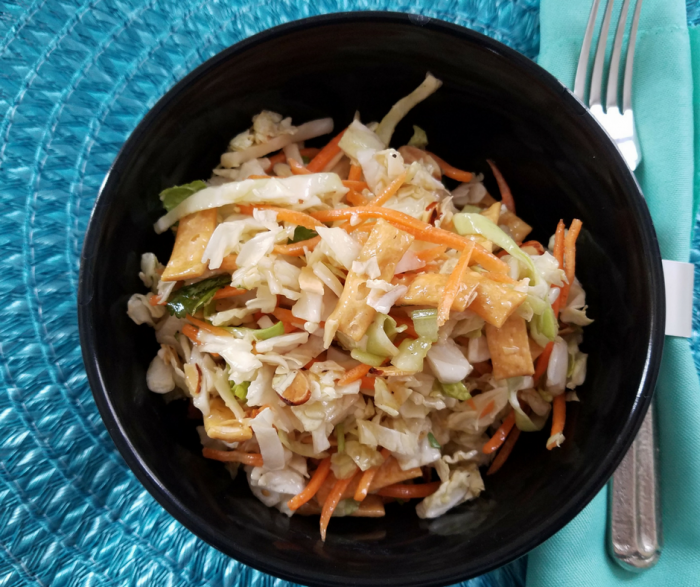 In a large bowl, mix together cabbage, lettuce, carrots, and onions until well combined. Pour dressing mixture over salad greens along with almonds and tortillas then toss gently to coat. 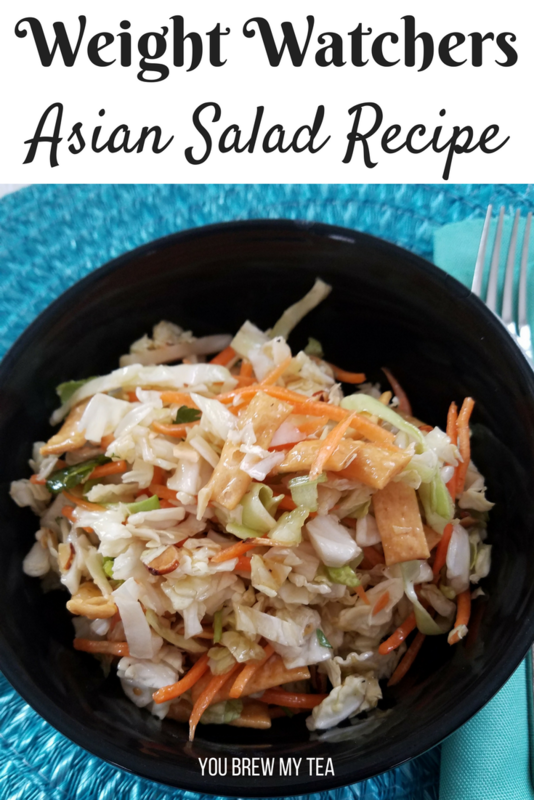 If you like a great salad for lunch but want something different, then this easy Asian salad recipe is a must on your meal plan! I love that it is one of those recipes that all of us enjoy. I often add some mandarin oranges into the mix, and the Wee Child likes his salad with some grilled chicken. There is nothing as good as a flavorful salad to add greens and fiber to your meal plan!